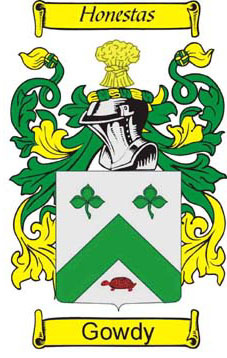 The Scottish surname of Gowdy is of nickname origin. It is in fact a variant of Goldie, which in turn is a diminutive form of Gold. Gold comes from the Old English personal surname of "Golda" or "Gold" from the metal of the same name. This was a very popular name in the Middle Ages in England. The name "Golda" could also have have been applied as a nickname to someone with fair or gold coloured hair. It was common practice in the Middle Ages to name people according to a personal or physical characteristic, and the colour of hair and skin were a main source for nicknames. The surname Gowdy appears in Edinburgh from 1598 onwards in the forms of Gowdie, Gaudie, and Goddie. The Surname was carried early to the north, appearing in Shetland first in 1576. There was also a town or village of this name near Dundee in Scotland. BLAZON OF ARMS: Argent a chevron between two trefoils slipped chief vert and a tortoise in base gules. Translation: Argent, or silver, denotes Peace and Sincerity. The Trefoil indicates Fertility and Abundance. The Tortoise signifies Invulnerability to Attack. Gules, or red, denotes Military Fortitude and Magnanimity. Translation: The Garb signifies Plenty or the Harvest of One's Hopes.